I’ve mentioned before that I’m often inspired by this blog and yesterday’s post was a TTV photo, which inspired me to tell you, dear Photodoto readers, how to create TTV photos. Luckily for you it’s very simple, in principle. TTV stands for “Through the Viewfinder” and to create one of these photos you need two cameras. Basically you set up your digital camera to shoot through the viewfinder of another camera. It sounds simple but requires quite a bit of patience to get it set up correctly. The best advice is to give it a try and practice until you get the hang of it. Also, try placing something dark coloured around the gap between the two lenses to keep out extra light. 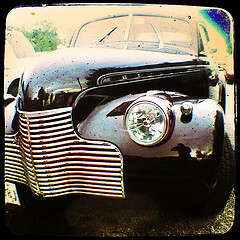 Oh, and check out the Through the Viewfinder group on Flickr for some more TTV inspiration.